Excellent food and a great location are must-haves for any successful restaurant, but good customer service is just as important. One of the most important parts of giving great customer service is knowing how to deal effectively with ​customer complaints. Things are bound to go wrong once in a while no matter how hard you try. 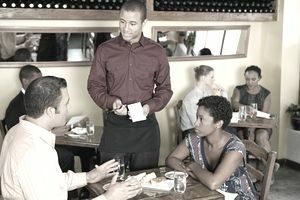 Food gets burned, orders get forgotten in the middle of a dinner rush, or new servers simply forget all their training. No matter the reason for the complaint, send your customer home knowing that, yes, there was a problem, but it is not typical of your establishment. Let her know that you, the owner, value her comments and her business. How you handle customer complaints will determine if the customer comes back to your restaurant. Listen to what your customer has to say. You have to listen, with your full attention, even — and especially — if you can’t fix the problem. Maybe a customer is displeased because there was a waiting line. There isn’t much you can do about that except let him vent, but make eye contact and nod while he does it. This basic rule of customer service is particularly important to keep in mind when the complaint is petty and teetering on the verge of being outright ridiculous. The important thing is that your customer is unhappy. Commiserate with him that the guy four tables over is too loud. He's right, so offer to move him to another table a little farther away. You might even consider thanking him for his constructive advice if you can manage to sound sincere. Anything less than commiseration or — if you can manage it — a solution will only rile him up more, and that's not in your restaurant's best interests. You want your customers to go away talking about how great your food was, not that crazy guy seated a couple of tables over that no one could shut up. The way you stand and look at a customer can speak more than words. Don’t cross your arms over your chest if you're feeling defensive. Avoid the urge to roll your eyes if you're feeling exasperated. Nod and smile no matter how irritated you might feel. This shows that you value her opinion and her business. You've demonstrated that you completely understand his frustration, that you're working on the situation, and you've offered something of a solution. And keep in mind that a long waiting line is a really good thing for your restaurant to have. That might improve your mood. The best route is usually to apologize and offer some sort of compensation when a customer has a problem that could have been prevented, such as an overcooked steak or a snippy server. Freebies don't have to cost you a lot of money, and they'll go a long way toward assuring future business. Consider offering the long-waiting-line customer a free round of drinks while he sits at the bar. How much will it really cost you? You might also offer a free dessert, a gift certificate for a future visit, merchandise such as a beer glass or a T-shirt, or to take a certain percentage off his meal. The extent of your gift should correspond with the magnitude of the problem the customer experienced. Every once in a while, you'll encounter a truly angry customer who declares, “I’m never coming back!” Maybe she's justified, but maybe she's not. Freebies probably aren't going to change her mind. Calmly assure the customer that you understand her frustration. Offer an apology — again — and let her know that you'd love to see her again if she changes her mind. The idea is to keep the situation from escalating. You don't want to let her get so worked up and loud that every other diner in your establishment begins to wonder what you did wrong. And there's a very good chance that she'll try your restaurant again when her anger has cooled if you send her off on a calm, courteous note. No, you probably don't want anything more to do with that customer, but it's in your best interest to reach out to her again. Her anger has almost certainly evaporated after a few days or a week — at least it's not at a fever pitch. Get contact information for your unhappy customer before she departs. Reach out to her later, even if it's just by email. Apologize again and keep it short and simple: "I wanted to thank you again for stopping by. If there's anything we can do to improve your experience next time, please reach out to me at this number in advance so that I can personally make sure that your experience is as pleasant as possible." It might sound like a lot of effort for one disgruntled customer, but word of mouth is king. Your response to customer service complaints could go a long way toward ensuring that your business stays profitable.